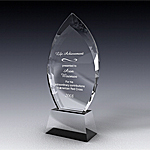 Our crystal flame awards are dedicated to achievers who ignite in others a passion for success. 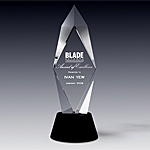 Produced from the highest quality crystal these flame awards and trophies sparkle with the brilliance of the facets. 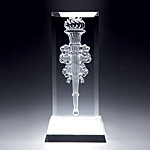 Flame crystal awards and trophies are favorite tokens of recognition and commemoration of exceptional deeds and highest achievements. 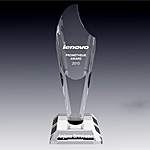 Flame awards are given as a tribute to an event, a major accomplishment, a career milestone, or an academic recognition. 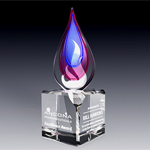 Among our best selling styles is the Triad Flame award, created from an art glass top that shined with different hues and colors and is set a top of clear crystal base. 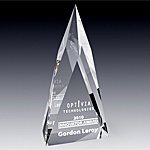 Our crystal Olympia flame award impresses with the shine of its clear crystal facets and the boldness of the black crystal base. 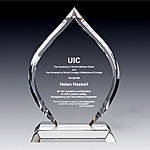 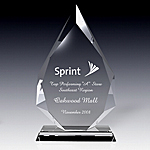 The striking combination of clear and black crystal makes this award exceptionally attractive. 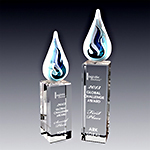 Some of the classic best-selling flame trophies are our crystal Elegance flame award, Monument flame award and the Prestige flame award. 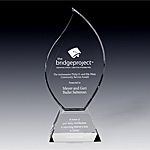 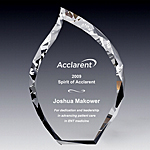 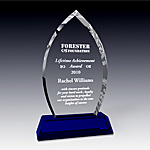 Most trophies offer amble etch space that can be personalized with logos and text. 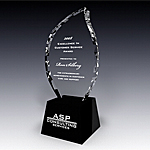 If you are looking for something sculptural, the crystal Torch trophy will impress you with its smart design.